Images in this collection were created and are copyrighted by Laurie Hatch. 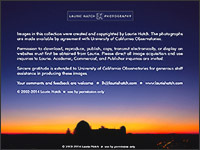 Photographs of Universtiy of California Observatories-Lick Observatory and W. M. Keck Observatory are made available by agreement with﻿ those institutions. Permission to download, reproduce, publish, copy, transmit electronically, or display on websites must first be obtained from Laurie. Please direct all image acquisition and use inquiries to Laurie. Academic, Commercial, and Publisher inquiries are invited. 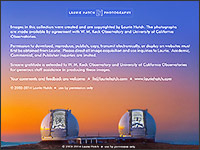 Sincere gratitude is extended to both Observatories as well as the Office of Mauna Kea Mangement (OMKM), and the Mauna Kea Visitor Information Station (VIS) for their generous staff support and assistance in producing these Observatory photographs. All photographs and text elements on this site are property of Laurie Hatch Photography • Copyright 1999-2014 Laurie Hatch • ﻿All Rights Reserved. Do not reproduce, publish, copy, or transmit in any form, including electronically on the Internet or World Wide Web, without written consent from the photographer. Thank you for respecting intellectual property rights protected by United States and International Copyright Treaty Laws.